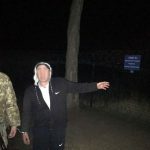 The border guards of Mostyskyi Detachment detected and revealed two foreigners nearby Ukrainian-Polish order, who intended to get illegally to the neighboring country. The district inspector of Border Guard Service received information from the inhabitants of the village Shegeni about two unknown persons of Asian appearance to be near the border. Reaction group started to the place immediately. Detained foreigners were stopped some tens meters before neighboring Poland just when they were trying to overcome the barrage fence. The detainees were the citizens of India, 1986 and 1991 YOB. They had passport documents. The law enforcers established that the foreigners arrived to Ukraine in established order, however, they continued their trip in illegal way. The protocols were prepared as to the citizens. Decision on the case of attempt to cross the state border of Ukraine will be made by the court. This entry was posted in Translated Media-News from Ukraine on April 25, 2018 by oksana.